German Translations - If you own, plan to purchase, or are thinking about eventually receiving a German bred German Shepherd Dog you may or may not know what a pain trying to translate the dogs pedigree can be. Not having access to a German-English dictionary can further enhance the problem. For that reason we have listed various German terminologies and the translations of each below. Other translations of terms most often connected with GSD’s, whether listed on their papers or used in training, can be found in the sections below as well. While these translations are in no way all encompassing, we do feel they are among those most often seen on pedigrees. We hope that this information will be of help to you when doing your translations and research in your dogs German Shepherd pedigree. 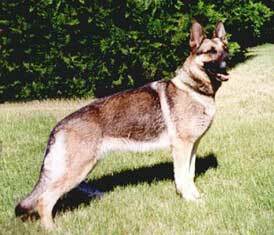 SchH(Schutzhund)- The dog has passed the tests for protection, tracking and obedience. I, II, or III denotes the level and difficulty of the degree awarded.